Drop in the Ocean is a six-day walk in six widening, concentric circles, performed around an installation: the ripples around a drop ((((((.)))))) 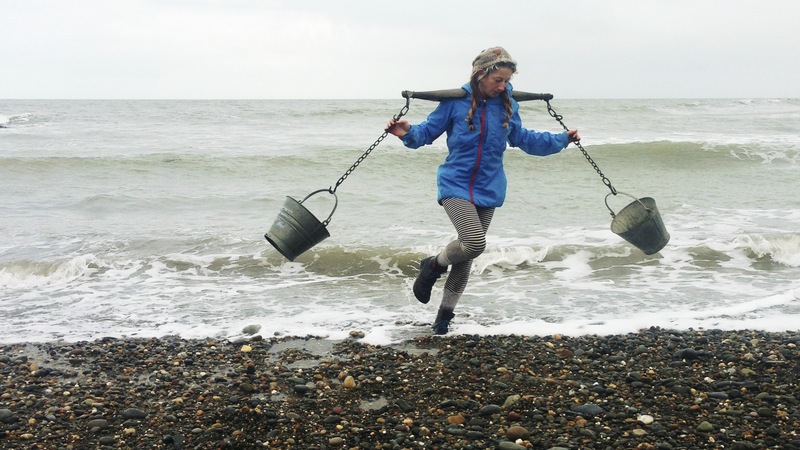 The performer carries water in two buckets on a milkmaid’s yoke as a provocation to enter into encounters with strangers. She invites them to make a wish, by taking a stone from the water in one bucket and holding it in their wet hand, while they think about water. The work is an attempt to carry (literally) and convey something of the sheer transformative sensuousness of water as a source of enchantment with life, and a medium for subliminally cultivating an ethics of care towards the world. The piece is also of course about water: facilitating a space for contemplation of our troubling, dichotomous relationship with it: that, in a changing climate we either have too little or too much. But also how in that dichotomous relationship there is mirrored the disconnection between our abstract understanding of environmental problems, and our everyday, embodied responses to them. Drop is part of the rural, relational arts practice that I call tracktivism: a synthesis of walking art, talking art (dialogic practice) and ecological activism. In that the shapes, routes and rules of my walking are guided by environmental concerns, it is a subtly activist redeployment of the aesthetics of walking art. But the walks are principally a device, used to facilitate unexpected conversations or interventions with the strangers I encounter.